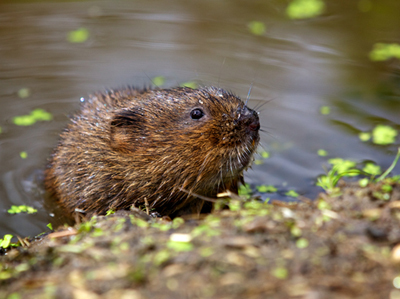 According to the Wildlife Trusts, water voles live along rivers, streams and ditches, around ponds and lakes and in marshes, reedbeds and areas of wet moorland. Look out for the signs of water voles such as burrows in the riverbank, often with a nibbled ‘lawn’ of grass around the entrance. Water Voles like to sit and eat in the same place, so piles of nibbled grass and stems may be found by the water’s edge, showing a distinctive 45° angled-cut at the ends.